Is “ObamaRail” Coming to Your State? In France, high-speed rail has pulled regions from isolation, ignited growth, remade quiet towns into thriving tourist destinations. In Spain, a high-speed line between Madrid and Seville is so successful that more people travel between those cities by rail than by car and airplane combined. China, where service began just two years ago, may have more miles of high-speed rail service than any other country just five years from now. And Japan, the nation that unveiled the first high-speed rail system, is already at work building the next: a line that will connect Tokyo with Osaka at speeds of over 300 miles per hour. So it’s being done; it’s just not being done here. Consider me on board. Get it? 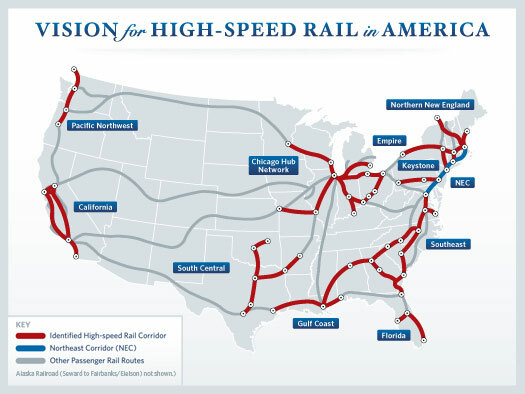 Anyway, my favorite part of the whole rollout is this cool little map, which tells you exactly where these 100 mph trains are going to take you when they are completed in 2020 or whenever. Hope you don’t live in the Great Plains! No trains for you!